It’s not your grandma’s creamy egg salad because it is my dad’s infinitely more flavorful, mayonnaise-free, paprika-dusted egg salad. And you’re gonna love it. 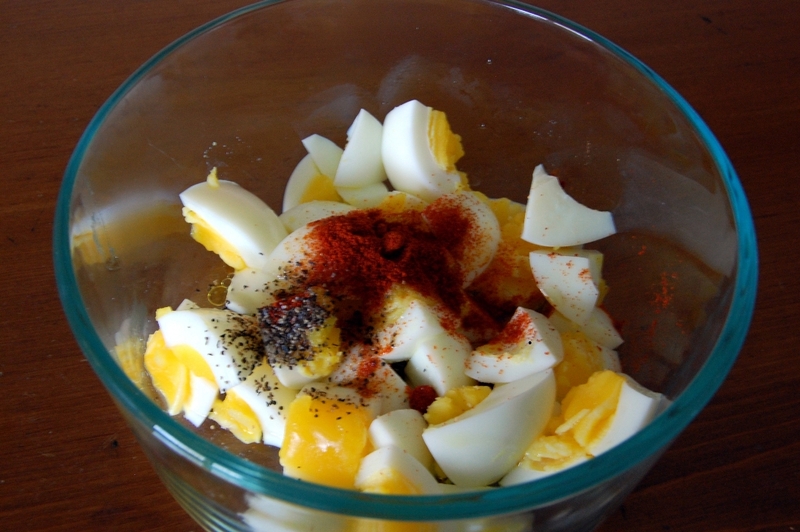 When I was growing up, egg salad night at my home consisted of two options- you could have my mom’s classic mayo-based egg salad or you could have my dad’s oil and vinegar-based paprika egg salad. If you’ve only ever had the creamy one, I urge you to give this a try. There’s a hint of tang from the vinegar and a slight kiss of sweet heat from the paprika that will have your taste buds swearing off the mayo for good. I have an issue with eggs boiled so hard that the yolks get that greenish hue. If you want eggs like the ones shown above (with yolks still vibrant yellow and just a very tiny bit shy of solid), follow these easy steps: bring water to a boil, gently drop eggs in for 5 minutes, then remove the pot from the heat but allow the eggs to remain submerged in the hot water for an additional 5 minutes. After this, shock them with cold water to stop them from cooking. Peel away. 1. Preheat oven to 350. Lightly butter bread and bake until toasted, approximately 10 minutes. Meanwhile, boil eggs to liking. 2. Dice eggs and combine with oil, vinegar, black pepper, paprika, and salt. Spoon egg salad over bread and serve. 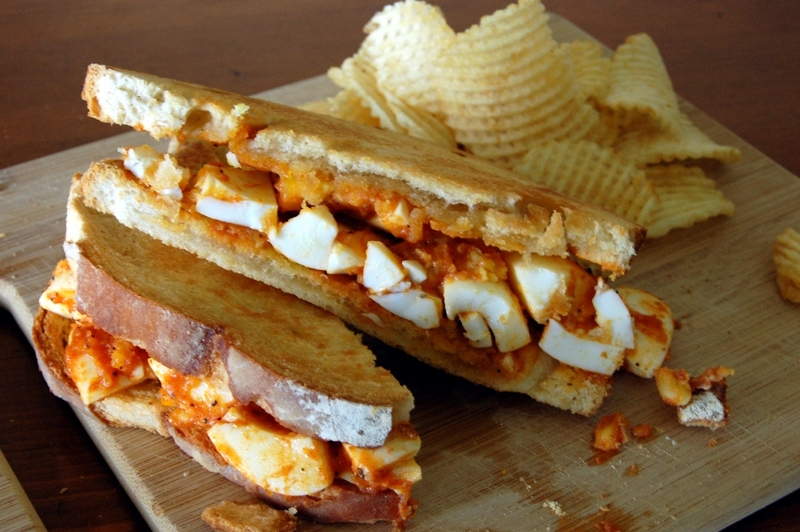 This entry was posted in Eggs, Vegetarian and tagged Cooking, Easy, Egg Salad, Eggs, Lunch, Mayo, Mayonnaise, Olive Oil, Paprika, Quick, Recipes, Sandwich, Simple, Vegetarian, Vinegar by Lazy Suzan. Bookmark the permalink. Hummus is an awesome idea!! I will definitely try that! 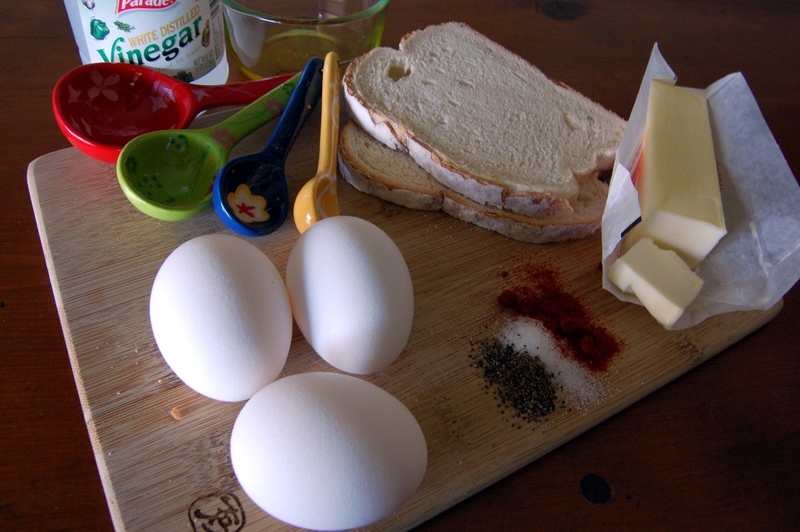 I am trying this for lunch tomorrow, I just love a good egg salad recipe! Really like this one. I prefer to make it (and eat it!) while the eggs are still warm. It enhances the flavor. I agree – I like egg salad warm, too. Thanks for stopping by! 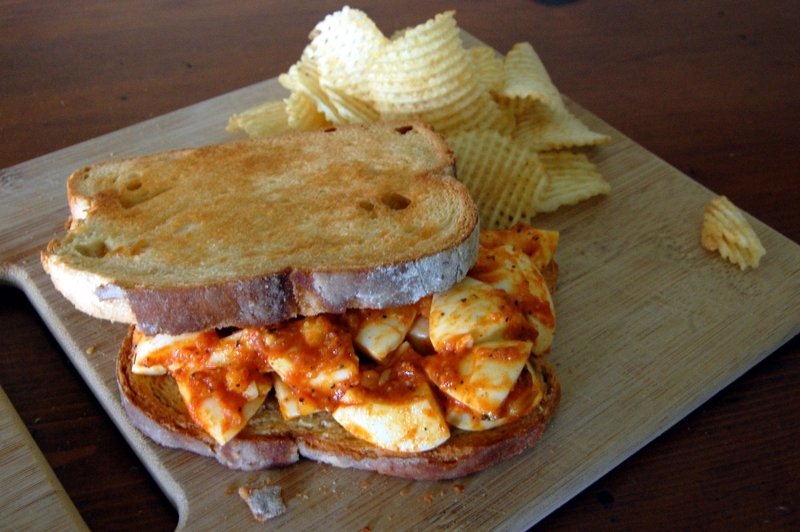 I’ve never been a big fan of egg salad, but I think I might like this. I’m going to try it for lunch one day this week. I like any kind of sandwich that has an egg in it and egg salad is especially good. Though I’ve no problems with mayo, your Dad’s version sounds great. I’ll be sure to give it a try. Thanks for sharing. Yeah mayo and I are good friends – we go way back. 🙂 Hope you enjoy!